The Dark Clan, unlike their name would suggest, its actually one of the most honorable of the Clans. Its powers of darkness are used to aid its fellows, and never to harm, except in self defense. 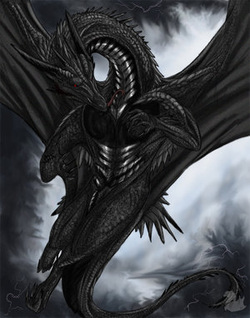 A Dark Dragon has the ability to take a life in his hand and crush it with a word, but it is something forbidden to all but the eldest Clan members. During the Sealing, the Dark Clan used their powers of eternity to perform the most vital part of the seal; the Eternal Void-Prison. Using their powers, they create a dimension where no creature can escape, and any beast that is trapped there is only trapped with its mind, forcing its body to decay at a normal rate. Due to the almost godlike power of the Old Ones, their bodies did not decay, but their minds where trapped within the Void-prison and their bodies where locked into the depths of the earth itself.